Dimensions: 24 1/2 x 22 in. 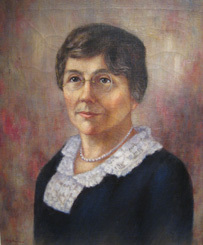 About the Sitter: Mary Augusta Bernard (c.1878-1933) came to UCA in 1912 and was an instructor of Drawing and Penmanship. She was later promoted to the rank of professor and head of the Department of Art. She held this position until her death in 1933. About the Artist: Nelly Deachman was born in Prescott, Arkansas in 1895. She attended Arkansas State Teachers College (now UCA) from 1914-1916, and went on the receive a bachelor’s degree and master’s of fine art from the Art Institute of Chicago. She has exhibited in many shows across the U.S. including: the Arkansas Museum of Fine Art , National League of American Pen Women, Illinois State Museum, National Gallery of Art, Art Institute of Chicago and the Findlay Gallery in New York CIty. Ms. Deachman worked as an art instructor in Stuttgatt, Arkansas and at the Elmhurst Art League. She also served as the director of exhibits at the Illinois Society of Fine Arts, and as manager of the Abbey Galleries in Chicago. She passed away in 1989.